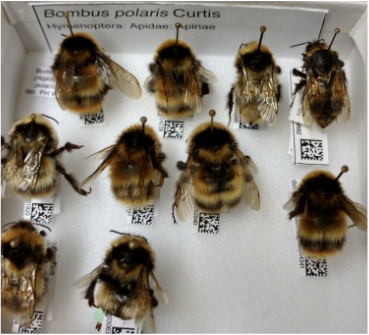 The importance of collections: identified specimens of Bombus polaris from the entomological collection at the University of Fairbanks, Alaska. Photo by M. Duennes. We use a combination of lab- and field-based approaches to examine how bees function in, and are influenced by, their environment. 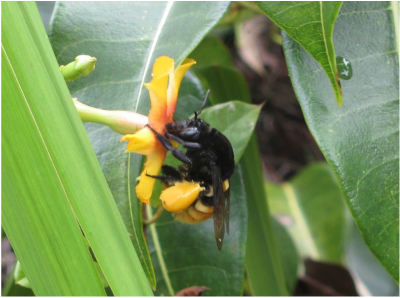 Our work primarily focuses on the level of the organism and the molecular processes underlying bee behavior and physiology, but we also examine how these processes scale up to influence bee population dynamics and ecosystem function in natural systems. There are more than 20,000 bee species worldwide, most of which we know virtually nothing about. We are also using comparative methods to characterize the molecular basis of fundamental processes in bees, such as larval development. Most bees rely on pollen and nectar from flowering plants as their sole or primary nutrient sources. Yet, in many ecosystems around the world, floral resource availability is being significantly altered by agricultural intensification, global warming, and other anthropogenic processes. 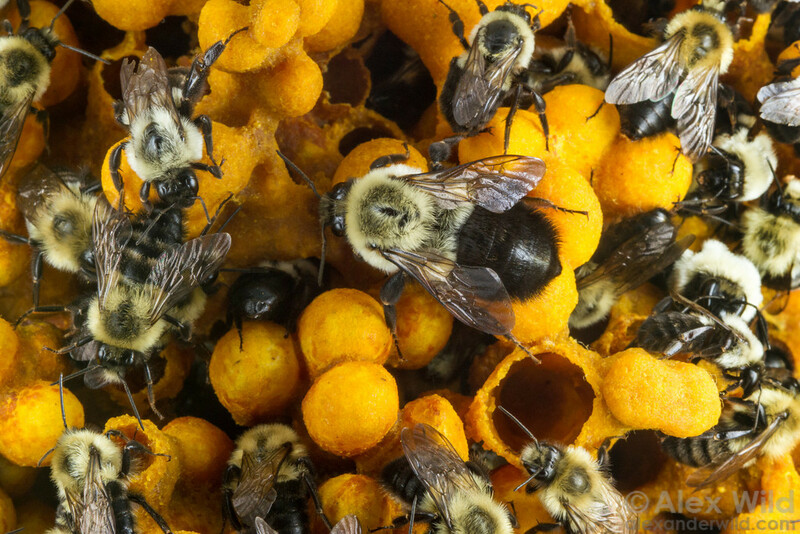 Our research focuses heavily on floral food resources, as these are rapidly changing, quantifiable resources that have direct mechanistic relationships to bee behavior, physiology, and population dynamics. In the lab, we are using experimental feeding assays to study how bees eat, what they eat, and how this influences physiology and health. In the field, we are developing novel methods to examine how nutritional landscapes shape bee foraging behavior and population dynamic processes. 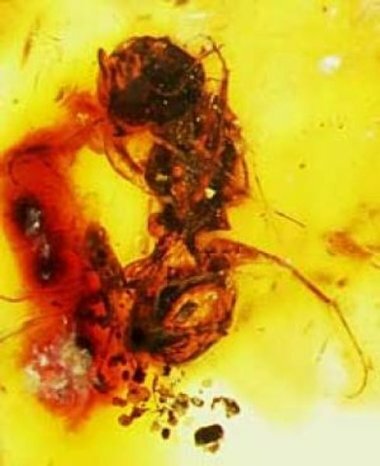 The oldest bee: the extinct Melittosphex burmensis, the oldest bee specimen, encased in amber. Photo used with permission from Poinar & Danforth (2006) Science 314:614. The evolutionar﻿y history of bees can give us insight into how this insect group responds to environmental change. Bees arose from a wasp-like ancestor more than 100 million years ago, and today the group is highly diverse and found from the tropics to the Arctic, living under a wide variety of ecological conditions. We are using comparative genomic approaches to understand how bees have adapted to these unique environments, with a focus on the role that natural selection has played in this process. Bees that have adapted to extreme environmental conditions are especially important models for understanding plasticity and resilience in the face of global change, given that many temperate areas are predicted to become hotter, drier, and/or more climatically variable in the coming years. We are studying the biology of bees in extreme environments in order to gain a predictive framework for anticipating how bees might respond to the global changes that threaten them. Most﻿﻿ bee species are solitary, but some lineages have independently transitioned to living a social lifestyle. The social bees and other group-living insects, such as ants and termites, have been extremely ecologically successful, in part because living in a social group creates a buffer between the individual and the environment. We are studying how and why some bees became social, and how their societies function today, in order to understand how sociality buffers bees against the direct impacts of their environment. Inside the colony: a queen (center) surrounded by males and workers in a Bombus impatiens colony. Photo by A. Wild.